Hi everyone!! Hope you all had a Wonderful Christmas!! For me, Christmas was spent with my family at home, a very nice, relaxing day, full of watching Christmas TV and eating far too much food, LOL!! I decided to wear a couple of newer items that I thrifted this month. The leggings I have on are wool leggings and amazingly warm, plus they have an elasticated waist-very handy for all that eating!! They were only £3.99-my best winter buy so far!! 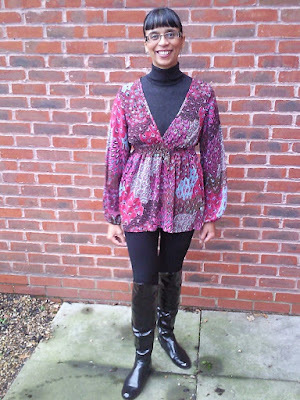 This week I found this Jane Norman chiffon paisley print top, which is an ideal layering piece and was £2.75 in the Sense charity shop. I've also got on my trusty OTK boots, which are so comfy. I hope Christmas was indeed a special and enjoyable day for you all too!! So, own up, who's off to the Sales today, LOL!!! My older son is off to the shopping mall with his friend who are both hoping for a bargain-I think I'll stick to my thrifting when the charity shops re-open next week!! Happy sales shopping and if you do indulge-wear flats!! Great that I was not the only one who ate too much. hahaha! Love your top. happy happy holiday!!! i am sending you my love and best wishes!!! 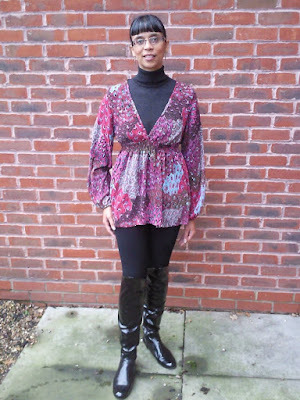 you looked very lovely with this floral top in plum colors - one of my very favorite hues! Merry Christmas! Loving those boots! I'm working at the sales rather then shopping! Nightmare!!!! Love the colours in the christmas day outfit top. smashing outfit. hope you had a wonderful holiday. cheer! You look great. Hope you had a lovely time. What a gorgeous top! So festive too. Here, leggings then leg-warmers then snowboots. I ventured off to the one store we had to go too. and it was so scary with so much snow. Thus, I didn't shop much. I kept wondering if we'd get back home before more snow. You look stylish and comfortable! Sounds like a very nice Christmas. I think I will try to shop for bargains online this year, tomorrow the stores will be crazy! Love the boots and a great chrimbo outfit! hey honey,Happy Holidays. I hope your older son found a great bargain. darling thank you for the lovely compliment on the velvet xmas day dress,it was self made. Hi everyone-thanks so much for all your lovely comments, so much appreciated!! Hi Sam, thanks so much!